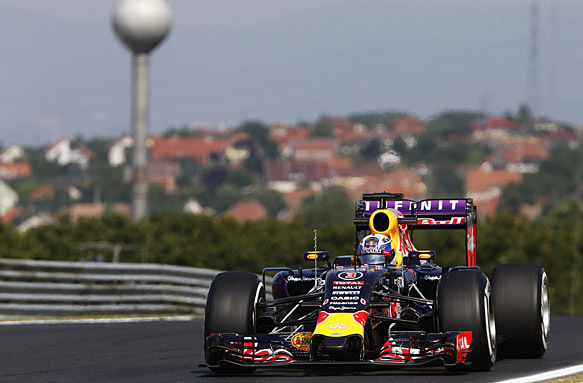 08:53 Welcome to AUTOSPORT's live coverage of final practice and qualifying for the 2015 Hungarian Grand Prix. We're just a few minutes away from the start of FP3. 08:54 As expected, it's another sunny day at the Hungaroring, although at the moment it's too early in the day for a repeat of the "sauna" (credit, Lewis Hamilton) conditions the drivers had to contend with yesterday. 08:54 Towards the front of the field, the interest appears to be developing behind the Mercedes drivers. But rather than it simply being a case of which Ferrari will be third, or how close Williams can get to the red cars, we have Red Bull in the mix as well this weekend. 08:56 Daniil Kvyat and Daniel Ricciardo split the Mercedes drivers in FP2 (partly down to Rosberg having a scruffy soft-tyre lap), but Red Bull is wary of how its form will compare to its rivals today when those with stronger engines than the Renault unit are able to turn their power up. 09:01 Sebastian Vettel is the first driver to take to the track. 09:01 He's followed out by his Ferrari teammate Kimi Raikkonen. 09:02 Just an installation lap for Vettel as he heads straight back into his Ferrari pitbox. 09:03 Felipe Massa also heads into the pits after an installation lap. 09:04 Lewis Hamilton emerges from the Mercedes garage to make his first appearance of the session. The world champion is looking for a clean sweep of the practice sessions after topping both sessions yesterday. 09:05 The Force India drivers are both out on track looking to make up for missing FP2 following Sergio Perez's suspension failure in the first practice session. 09:07 Replays show Carlos Sainz Jr looking up at Turn 1 and the Toro Rosso driver ran wide. 09:08 Verstappen deposes Grosjean at the top of the times in these early laps - 1m26.363s. 09:09 The Force Indias sit third and fourth - expect to see a lot of Hulkenberg and Perez in this session as they play catch-up. 09:09 Another replay of Sainz's lap shows he locked up at Turn 12 and ran over the run off area at the exit of the corner. A scruffy lap that. 09:11 Daniel Ricciardo is going nowhere fast - he's discussing things with his engineers in the Red Bull garage. 09:11 We've seen everyone except the Red Bull drivers and Maldonado so far. 11 drivers have set times. 09:12 Replays show Roberto Merhi got onto the grass going into Turn 1 and he ran wide. Moments later Perez spins at the same corner and carries on. 09:12 No surprise that everyone is on the medium-compound tyres at the moment. We'll see the softs later on - perhaps with Force India taking to them first as their drivers didn't run on those tyres yesterday. 09:13 Vettel and Raikkonen are on quick laps here, expect to see the Ferraris appear at the head of the field shortly. 09:14 Replays show a piece of the Force India falling off as Hulkenberg brakes for Turn 1. 09:14 Vettel goes fastest with a 1m26.322s, but Raikkonen comfortably beats that with a 1m25.943s. 09:15 "The mix is not as good compared to yesterday - I cannot attack the brakes," complains Sainz. 09:16 Sainz slots into fifth with his latest lap, while moments before that Alonso (7th) also improved. 09:16 It was a piece of the rear impact structure that fell off Hulkenberg's car. 09:16 Maldonado is on the leaderboard now in P9, so it's only the Red Bulls we haven't seen yet. Williams and Mercedes are yet to set times, but they've all logged a lap. 09:17 "Very, very, very poor rear grip. We've lost all rear grip," announces a frustrated Button. His team says they can see it in the data too. 09:17 Vettel runs a touch wide a Turn 1. 09:18 Nico Rosberg does a practice start from the pitlane exit. 09:18 Vettel moves ahead of Raikkonen by 0.017s at the head of the field - 1m25.926s. 09:18 Raikkonen is responding though - he's 0.010s up on this lap. 09:19 "Still lacking rear stability," says Hulkenberg. He's probably missing some downforce after a piece fell off the rear of the car a little earlier. 09:19 Good final sector for Raikkonen - he crosses the line with a 1m25.661s and is 0.265s ahead again. 09:19 Vettel is the next driver to do a practice start at the exit to the pitlane. 09:20 Sainz is warned the the wind level is, "increasing compared to yesterday." 09:21 Rosberg attacks the kerbs at Turns 6 and 7. 09:22 Rosberg's first lap of the session puts him four tenths clear of the Ferraris - 1m25.201s. 09:22 It's very quiet out there at the moment - only Rosberg and Raikkonen on track. 09:22 "It's a bit better but still very weak when I touch the throttle. I think we should go back on the changes we've made," says Button. 09:23 Red Bull sends its cars out for the first time today - Ricciardo and Kvyat head out while the track is relatively empty. 09:26 As expected, Force India takes to the soft tyre early. Both drivers are on the yellow-sidewalled Pirellis already. 09:26 Perez runs very wide through Turn 13. 09:26 Ricciardo and Kvyat slot into third and fourth with their first laps. At the bottom of the order, we're yet to see times from Massa, Bottas and Hamilton. 09:27 Perez goes second on softs, half a second adrift of Rosberg's P1 time on mediums. 09:27 Hulkenberg smashes Perez's effort - he does P1 with a 1m24.483s. That's also 0.390s faster than Rosberg's benchmark. 09:27 Williams appears on the timesheets - Bottas is fifth, Massa ninth. 09:28 Hamilton also sets a time, he slots into second on mediums, two tenths down on Hulkenberg's soft-shod lap. 09:28 Adrian Newey looks intensely at the Red Bull timing screens with his cars now out on the circuit. 09:28 Rosberg becomes the latest driver to lock up and run wide at Turn 1. 09:29 The Force Indias are 1-2 in the speed traps at the moment. 09:30 "The brakes were a little bit worse there, was it because they were too hot or two cold?" asks Rosberg after his Turn 1 lock up. The team tells him they were a bit on the cool side. 09:30 Alonso is the first non-Force India to take the soft tyre. 09:32 Replays show Hamilton also locked up at Turn 1. Smoke pours off the front right tyre. 09:32 Alonso has to fight his McLaren into Turn 1 with two stabs at the steering wheel. 09:33 Alonso encounters Massa at the exit of the chicane, but the Wiliams driver helpfully pulls to the left and lets the McLaren fly by. 09:33 Alonso's soft-tyre lap puts him third - 0.3s adrift of Hulkenberg's effort on the same compound. 09:34 Verstappen locks up at Turn 1. "I can't warm up the brakes!" he complains. 09:36 Vettel has to fight his Ferrari through Turn 12. 09:37 A cleaner lap for Vettel - he moves up from 10th to sixth, with the third-fastest medium tyre lap (nearly 0.7s slower than Hamilton). 09:37 Hamilton heads into the pits. He'll want to get rid of those tyres he flatspotted earlier. 09:37 "Do I have a puncture?" asks Raikkonen. The team tell him no, but he does have a water leak. 09:38 Replays show Raikkonen had to bump over the kerbs at Turn 6 and the Finnish driver shut down his Ferrari car as he entered the pitlane. 09:40 Button (on softs) is up to fifth, half a second down on Alonso's P3 mark. 09:40 "The rear tyres drop off a lot and you get a lot more oversteer," reports Verstappen. 09:40 Only Force India and McLaren have taken the soft tyres so far, with less than 20 minutes to go. It won't be long before this session turns into a mini qualifying. 09:41 Replays show Grosjean running very wide through Turn 4 - possibly caused by a sudden gust of wind? 09:42 Sainz also had a very wild moment through Turn 4 when the rear of the car snapped away suddenly and he did well to hold it. 09:45 Rosberg is the first of the major players to emerge on the softs. 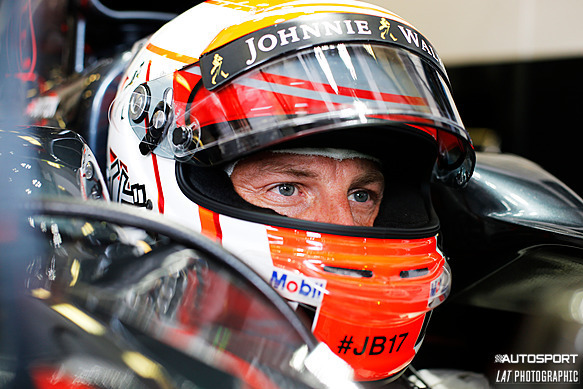 09:46 "I'm struggling with the tyres on the first lap, especially the rears," moans Button. The tells him the they will see what they can do about it. 09:47 No surprise to see Rosberg well on course to go fastest with this lap. 09:48 Sure enough, Rosberg moves to P1 on his first soft-tyre lap. A 1m23.095s puts him 1.3s clear of the best lap by Hulkenberg. Hamilton is also out on the soft now, so we'll get a more accurate idea of how good that Rosberg lap is shortly. 09:48 Kvyat runs perilously close the grass on the edge of the track under braking for Turn 11. 09:48 Kvyat moves up to seventh, still on mediums. That's around 0.7s adrift of Hamilton's current harder-tyre benchmark. 09:49 Hamilton is warming up his new soft tyres ahead of his flying lap. 09:50 Mercedes reserve driver Pascal Wehrlein looks on from the Mercedes pits. 09:50 Both Mercedes drivers are on flying laps now. Rosberg is on his second 'push' lap of this run, Hamilton on his first. Both are on softs, and there's little to choose between their laps so far. 09:51 Hamilton's first soft-tyre attempt is 0.098s faster than Rosberg, whose own lap fell away in the second and third sectors as his slightly older tyres cried enough. 09:51 Vettel and the Toro Rossos have taken softs as well now. 09:52 "Still no real bite from the front," reports Kvyat. "Lets see what it's like with the options." That indicates Red Bull are about to bolt on a set of soft tyres. 09:52 Sainz moves behind the Mercedes drivers into third - 1.3s off Hamilton's pace. 09:52 Sparks fly from underneath Verstappen's car as he runs over the kerbs on the exit of Turn 4. 09:53 Verstappen is 0.3s off of Sainz's lap - he slots into fifth. 09:54 Vettel completes his first soft-tyre lap. He's third, but 0.889s slower than Hamilton out front. 09:55 Replays show Alonso suffered a massive lock up under braking for Turn 1 and the Spaniard run very deep into the run off area. 09:55 Vettel will be Ferrari's only benchmark ahead of qualifying, with Raikkonen's session disrupted by that water leak that forced him back to the garage. 09:55 Grosjean has a small lock up going through Turn 3. 09:56 We have the Red Bulls on softs now. Let's see if they can be in the mix like they were yesterday. 09:57 Kvyat goes fifth, behind Hamilton, Rosberg, Vettel and the Toro Rosso of Sainz. 09:57 Ricciardo is only ninth, with a slow middle sector. 09:57 Bottas has to brake to avoid Maldonado going through the final corner. 09:58 Williams watch - Bottas 13th, Massa 15th at the moment. 09:58 Rosberg has stopped at the end of pitlane and he is climbing out of the car. 09:59 Rosberg was in the position to do a practice start, but the engine stopped. The marshals, and Rosberg for a little bit, push the Mercedes back into the pitlane. 09:59 Massa moves up the order slightly, from 15th to 12th. He's 2.097s off the pace. 10:00 Kvyat's second attempt on these tyres moves him ahead of Sainz - he's fourth. 10:00 Rosberg stands in the pitlane and looks a little bewildered. Four Mercedes mechanics are walking down the pitlane to recover Rosberg's car. 10:00 Bottas joins Massa in improving, but he's only 14th. 10:02 That's the session over then. Nothing in it (0.098s) between the Mercedes drivers, with Vettel the only challenger within one second of Hamilton and Rosberg. 10:06 So with FP3 completed, here's the final order. We'll be back on AUTOSPORT Live in the build-up to qualifying, which starts with Q1 at 1pm UK time. See you then. 11:42 Less than 20 minutes to go until qualifying for the Hungarian Grand Prix, welcome back to AUTOSPORT's live coverage. 11:43 We should be in for a fascinating session. Yes, it's going to be an all-Mercedes affair in the battle for pole, but there's plenty of potential for some action. 11:44 Ferrari hasn't had a smooth weekend at all yet. Technical problems held Sebastian Vettel back on Friday, while Kimi Raikkonen suffered a front wing failure. Vettel then spun twice on Friday afternoon, and Raikkonen didn't get a qualifying simulation run this morning because his car suffered a water leak in FP3. 11:45 Williams didn't expect to be matching its British Grand Prix performance this weekend at the high-downforce Hungaroring, and so far that has proved to be the case. Neither of its cars were in the top 10 in FP3, but the British team often plays conservative in practice, so let's see if its cars end up in the Q3 mix. 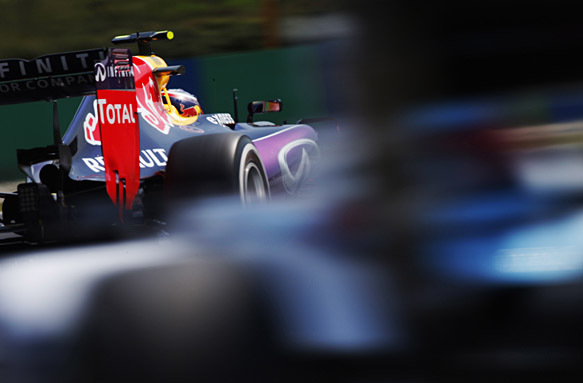 11:46 Red Bull raised hopes yesterday when its cars were second and third between the Mercedes drivers in FP2. The team warned that it was no guarantee of a repeat performance on Saturday, and this morning it looked like the Renault-powered RB11 has slipped behind Ferrari in terms of one-lap pace, with Daniil Kvyat fourth behind Vettel. 11:57 Track temperature is over 50C for this session. With these high temperatures there has been a big gap between the two tyre compounds, so it could be that even the fastest cars will have to use up a set of softs to get through Q1. 12:00 Q1 has started, the pits are open. 12:00 Nico Rosberg is the first driver to take to the track. 12:01 It's not often we see a Mercedes open proceedings in Q1. 12:01 Lewis Hamilton follows his Mercedes team-mate straight out onto the circuit. 12:02 Most cars are heading out for an exploratory run on the medium tyres. Merhi goes straight for the softs, not having to save any for later as he knows he'll be out after Q1 (all things being equal). 12:02 Rosberg starts his first flying lap. 12:03 Rosberg runs very wide at the exit of Turns 3 and 4 and he makes full use of the run off area over the kerbs. 12:03 Rosberg locks up at Turn 13 and misses the apex. 12:03 Rosberg kicks Q1 with a 1m25.262s. 12:04 Hamilton smashes Rosberg's messy first lap - he's fastest with a 1m24.293s. Verstappen slots in third, four tenths down on Rosberg. 12:04 Sparks fly from Ricciardo's Red Bull on the run down to Turn 2. 12:04 Sainz is four tenths down on team-mate Verstappen, and Bottas beats them both in the Williams to take third. 12:05 Hulkenberg moves into fourth behind Bottas. Massa's first lap puts him sixth, between the Toro Rossos. 12:05 "Big understeer, big understeer," reports Rosberg. 12:05 Ricciardo edges Bottas for early best of the rest, he's third now. 12:06 Vettel capitalises on Rosberg's poor first lap to go second in the Ferrari, 0.6s behind Hamilton. Rosberg is going again. 12:06 Alonso heads out onto the circuit with the soft tyres. 12:06 Rosberg has to dodge a Sauber and a Williams between Turn 13 and the final corner. 12:07 Rosberg improves, but he's still fractionally slower than Vettel so he stays third (partly thanks to traffic). 12:07 Raikkonen's first lap puts him sixth. 12:08 Bottas abandons his lap and heads for the pits. 12:08 Massa suffers a huge oversteer moment at the final corner. He did well to hold it. 12:08 Button briefly goes fourth on softs, but he is quickly deposed by Kvyat's Red Bull. 12:09 Rosberg's still unhappy: "There's something wrong with the balance, so much understeer. Get into the data, look at the settings and everything." 12:09 Hamilton is another driver battling a touch of oversteer, this time at Turn 13. 12:09 New P1 benchmark for Hamilton (just) - 1m24.213s. And Ricciardo's Red Bull moves into second, just 0.4s adrift with both on mediums at this stage. 12:10 Replays show Maldonado missed his braking point for Turn 1 and he went very deep into the run off area. But the Lotus driver didn't suffer a lock up like so many other drivers did earlier today in FP3. 12:11 Button gets feedback: "Middle sector looks good, possibly time to find in sector one so let's go for another lap." 12:11 Nasr has a snap of oversteer going onto the pit straight. 12:12 Hulkenberg's got problems with his seat and wants Force India to check it: "Feels like it's digging into my right shoulder." 12:12 Replays show Rosberg going extremely wide through the exit of Turn 4. Did he get a sudden gust of wind? 12:12 Five minutes to go in Q1. Maldonado, Perez, Merhi, Stevens and Grosjean are in the drop zone at the moment. 12:13 Plenty of drivers, including Rosberg, heading back onto the track on the soft tyres. 12:13 Bottas's soft tyre attempt puts him fastest by 0.5s - 1m23.649s. 12:13 Hamilton remains in the pits. For now. 12:14 Grosjean fights the Lotus into Turn 1. 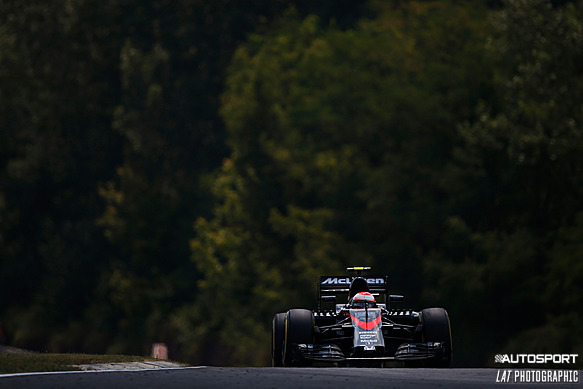 12:15 Button is fourth, but is told: "We think we will need to run again when other cars fit options." 12:15 Ricciardo has started another run on the mediums. That's brave from Red Bull - he's currently third, but the gap between the tyres is significant. 12:15 Hulkenberg goes second, 0.4s behind Bottas. Verstappen takes P2, and Grosjean's first proper lap puts him in the top six. 12:15 Hamilton does head onto the track with the soft tyres. 12:16 It's all happening now. Rosberg is P1 from Kvyat, Raikkonen, Bottas. 12:16 Hamilton is down to 10th now, so it's a good job he's gone back out for a soft-tyre run. 12:17 Alonso locks up going into Turn 1, but it's not as dramatic as the one he suffered in FP3. 12:17 Ricciardo is currently 12th, trying to get through on mediums. 12:17 Hulkenberg: "I'd be very surprised if that's not good enough." He's ninth at the moment and has pitted. 12:18 The flag is out. 12:18 Alonso got through just before the flag, moving up to P14, putting Button in the drop zone. 12:18 Hamilton goes fastest by 0.089s. 12:19 LAWRENCE BARRETTO: "That leading time from Lewis Hamilton is just under two tenths slower than his team-mate Nico Rosberg's pole time here last year." 12:19 Button, Ericsson and Nasr have all completed their laps, and all failed to get out of the elimination places. 12:19 Sigh of relief for Sainz, who scrapes through by a tenth of a second. 12:19 Rosberg's a bit happier with his car, but not completely content: "Much better on the balance, there's still understeer though. So keep checking if we're on the wrong place on the aero balance." 12:20 Replays show Button locking up as he went through Turn 13 on his final lap. 12:21 Energy problems for Button: "We didn't get deployment on the pit straight." McLaren: "Yeah, we don't understand why. That has cost us." 12:21 EDD STRAW: "Really good effort by Ricciardo to ensure he got through to Q1 using only the medium tyres. Nobody else had the confidence to risk that. Had he given away just over three tenths, he would have been knocked out. Says a lot about his ability to perform under pressure." 12:23 The eliminated Nasr says that he "lost it in the last two corners". 12:25 Q2 begins. It'll be soft tyres all the way from here. 12:27 Q2 is almost two minutes old and nobody has ventured out onto the track. 12:28 Vettel and Bottas finally take to the track. 12:28 Raikkonen heads out too. 12:29 The Ferraris are on new softs, Bottas (and Massa) are on used tyres. 12:29 Bottas holds back from Vettel to give himself a clear run. Unless someone comes out of the pits and spoils that of course. 12:30 Vettel runs wide through Turn 4. He's attacking this lap. 12:31 Vettel posts a 1m23.168s. 12:31 Raikkonen goes second (+0.2s), and Bottas is 1.3s adrift on his used tyres. 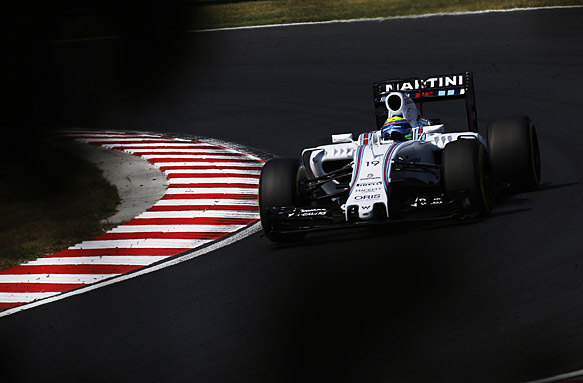 12:31 Massa is half a tenth quicker than Bottas, taking third. 12:31 Lewis Hamilton starts his first flying lap of Q2. 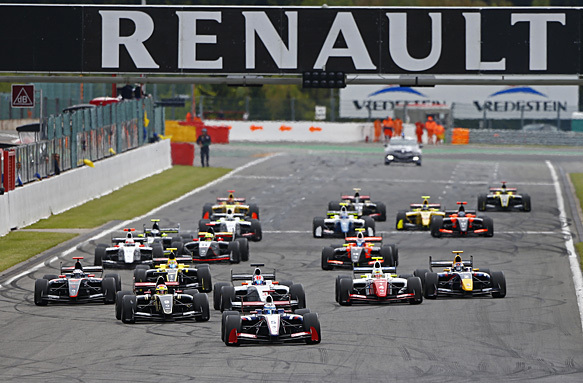 12:32 Sainz slots into fifth behind the Williams drivers. 12:32 Alonso has stopped at the exit of Turn 13. 12:32 Alonso is pushing his car up the hill towards the pitlane. The red flags are out. 12:33 The marshals have now joined Alonso in pushing the McLaren into the pitlane. 12:34 The drivers returning to the pits are having to go slowly past the stricken McLaren. Alonso and the marshals are pushing it up the hill. 12:34 Alonso waves the cheering crowd as they push the car closer the pitlane. 12:35 The McLaren mechanics have now joined the pack of people pushing Alonso's car down the pitlane. 12:36 Q2 is green again. 12:37 Alonso raises his eyes skywards as he walks back to the McLaren garage. The team have now got the car back to their box. 12:37 Hamilton heads back out onto the track. 12:38 Alonso has his helmet off in the McLaren garage. It looks like it's game over for him, despite all that pushing. 12:39 Hamilton locks up going through Turn 2. But it wasn't a big one. 12:39 Rosberg's "big understeer" is back. 12:40 Hamilton locks up again, this time at Turn 13. 12:40 Rosberg goes fastest with a 1m22.775s. Hamilton comfortably beats that with a 1m22.285s. 12:41 Hulkenberg locks up going through Turn 13 and his Force India slides wide. 12:41 Ricciardo slots into fourth, between Vettel and Raikkonen. 12:42 Ricciardo, having completed his flying lap, wandered off the track at Turn 1 as he got out of the way of one of the Williams drivers. 12:42 Kvyat is sixth now, with Hulkenberg seventh, Verstappen eighth, and the Williams drivers next up. 12:44 Grosjean moves 10th, so Hulkenberg is out. 12:44 Sainz can't get out of the drop zone - 12th. 12:44 Maldonado also fails to get through to Q3. 12:45 Perez jumps Maldonado for P13, but that means he's out too. 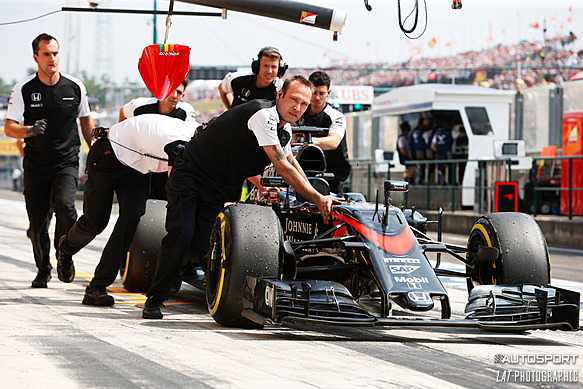 12:52 Q3 starts, a little behind schedule following that Alonso red flag in Q2. 12:53 Rosberg is the first driver to take to the track in Q3. 12:53 Hamilton too, heads out onto the circuit. 12:54 Rosberg starts his first flying lap of Q3. 12:54 Used softs for the Mercedes drivers, Kvyat and Grosjean. 12:55 Vettel, Ricciardo, Raikkonen and Bottas all on new tyres. 12:55 Rosberg using all the runoff area he can on the exit of Turns 3 and 4. 12:56 1m22.766s for Rosberg - now let's see what Hamilton does. 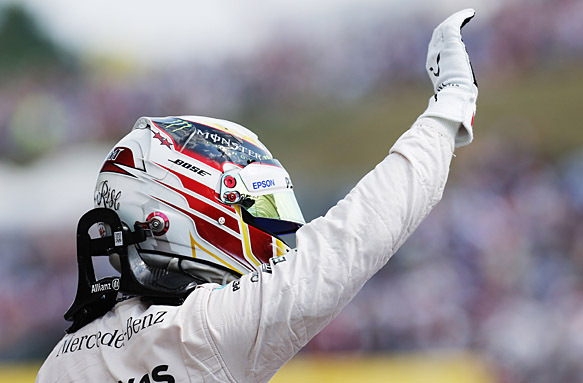 12:56 Hamilton takes provisional pole with a 1m22.408s, 0.358s clear of Rosberg. 12:57 Vettel is third, half a second down despite his new-tyre advantage. 12:57 Bottas goes very wide through the final corner. 12:57 Raikkonen fourth, Bottas fifth, Grosjean sixth. 12:57 We're waiting on Ricciardo, Kvyat, Massa and Verstappen. 12:58 Rosberg is wheeled back into the Mercedes garage. 12:58 Massa starts his first flying lap of Q3. 12:58 P4 for Ricciardo. He's 0.6s off pole, and sets the best time in the middle sector. 12:59 So Mercedes are clear of the field even without taking new tyres for those first runs. 12:59 Massa's lap puts him eighth, ahead of Grosjean. Verstappen is still in the pits, so he'll be going once in Q3. 13:01 Ricciardo says he "struggled to rotate the car, lost a bit of time there." Vettel on the other hand "got a bit too greedy". 13:01 Replays show Massa locked up at Turn 1, that will have cost him time. 13:01 That's a congested battle for best of the rest between Ferrari, Red Bull and Williams. Should be fascinating for the end of Q3 here. 13:01 Hamilton heads out for his final run of this qualifying session. 13:02 Verstappen makes his first appearance on track in Q3. 13:02 Everyone is on brand new soft tyres for these runs. All 10 cars on track. 13:03 Hamilton is getting very close to the back of Raikkonen as the drivers scrap over free air for their final laps. 13:03 Hamilton is faster than Rosberg in the first sector. 13:04 The chequered flag is out. 13:04 Rosberg locks up massively at Turn 13. 13:04 Rosberg fails to beat Hamilton's previous time. 13:04 Vettel closes to +0.3 on Hamilton, but that's not enough to beat Rosberg to second. 13:05 Hamilton finds more time, he's fastest with a 1m22.020s - half a second clear. 13:05 Ricciardo is fourth, missing out on beating Vettel by less than a tenth. 13:05 Hamilton waves to the crowd, delighted by his efforts. 13:06 EDD STRAW: "Disappointing final lap from Rosberg. Decent first sector, just half-a-tenth off Hamilton's pole lap, but then just lost time. Certainly should have been closer but couldn't string it together." 13:07 Rosberg climbs dejectedly from his Mercedes. 13:08 Hamilton positively bounces out his Mercedes and stands triumphantly on his car as he waves to the crowd after securing his fifth pole at the Hungaroring. 13:09 The drivers are studying the timing screens intently as they are weighed in parc ferme. 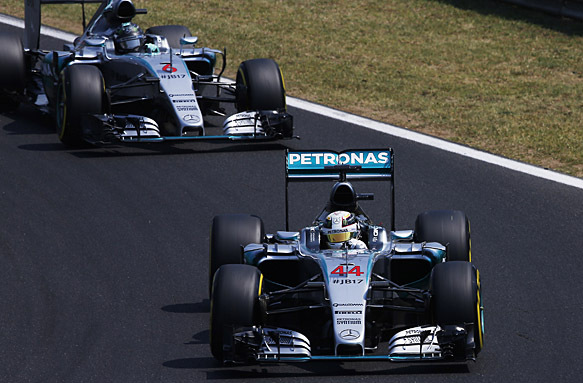 13:10 EDD STRAW: "Hard to see that Hamilton would have been challenged even if Rosberg had done a better lap. He looked very strong throughout qualifying at a track where he often excels."